What kind of a person puts testicles on his truck? I guess maybe he’s into Neuticles too. Nicole and Carlton and I had Mongolian BBQ last night at a fundraiser for the Indianapolis Rowing Club (didja know it’s cheaper when you only make veg stir fry? ), and then when they dropped me off, they asked if I had any dead bugs. Being the consummate housekeeper I am, I was able to provide several pill bug carcasses from my kitchen floor (they sneak in whenever it rains), and we found two live spiders, too! Here’s Nicole catching one in a plastic bag. Apparently they caught a praying mantis on their screened porch and are trying to keep it alive in the house now. (KNH, that’d make a good picture if you’re looking for November blog material.) BTW, that farmhouse-style kitchen table and chairs is for sale if anyone wants it. 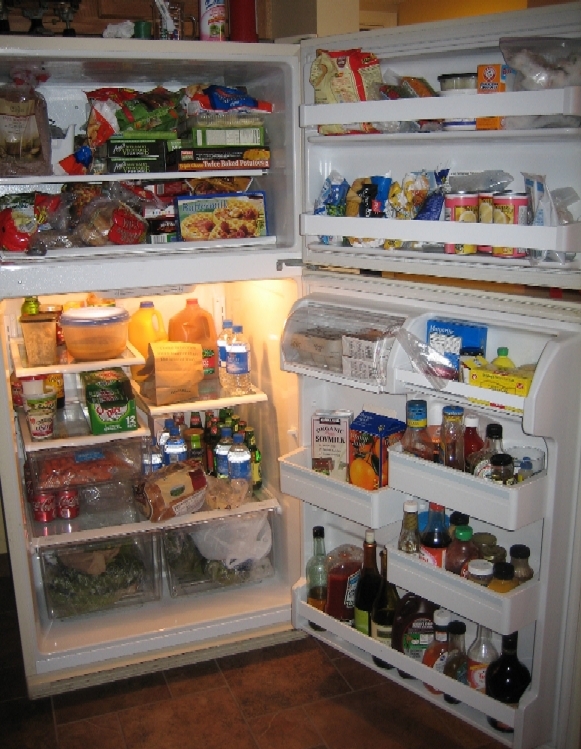 And of course it’s Fridge Friday! Not much has changed from last week, though some soymilk cartons are gone. I decided I’d share the outside which is more fun. Featured items are a picture of Luke, my very first house rabbit, a magnet from KNH about not putting dirty things in my mouth, a comic with St. Peter, surrounded by haloed chickens, telling Colonel Sanders, “I don’t seem to be able to find your name on the list,” and of course my reminder board. On top of the fridge are essentials like a beaker mug with markers for the board, a Maglite and a fire extinguisher (PASS! ), and an old balance I got from my first real lab job that hasn’t been calibrated since 1978. On the bottom half is KNH’s baby shower invitation (I guess that could probably come down now! 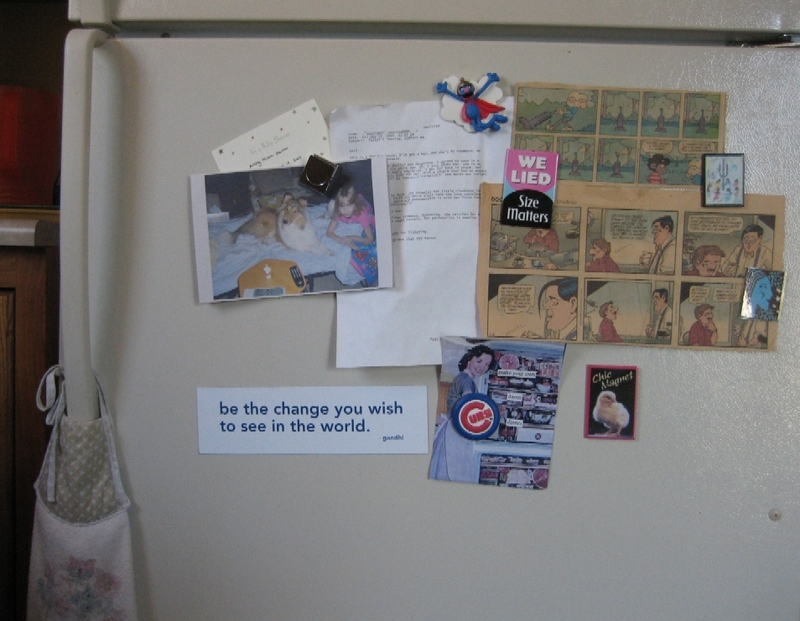 ), some comics, a post from a message board from whence my bunny Vegas got her name, and the Cubs magnet holds a postcard that says Make Your Own Damn Dinner. Oh, and I never ever use that towel. This entry was posted in Completely random, Rowing/Biking/Sweaty Stuff, Vegetarian by Amy. Bookmark the permalink. It is strangely popular in red neck areas, like…my entire state. We don’t know each other well so this may not make sense but it strikes my sense of the ridiculous hard enough to knock out giggles when I see a “Bush” bumper sticker over the dangling testicles. 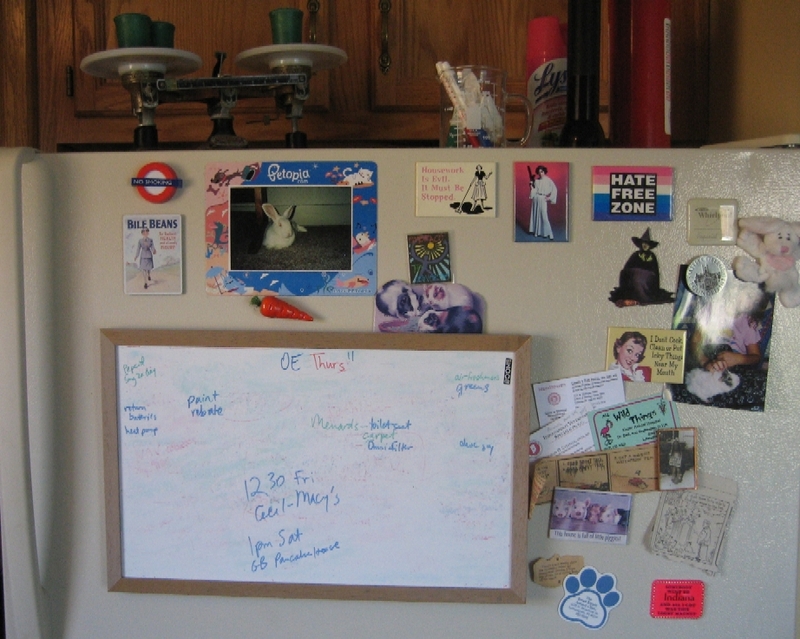 I like that fridge dry erase board! I want a copy of the Colonel Sanders comic! I’ve never noticed it. Hilarious. These were nice, swinging gold ones in a real sac-like film. 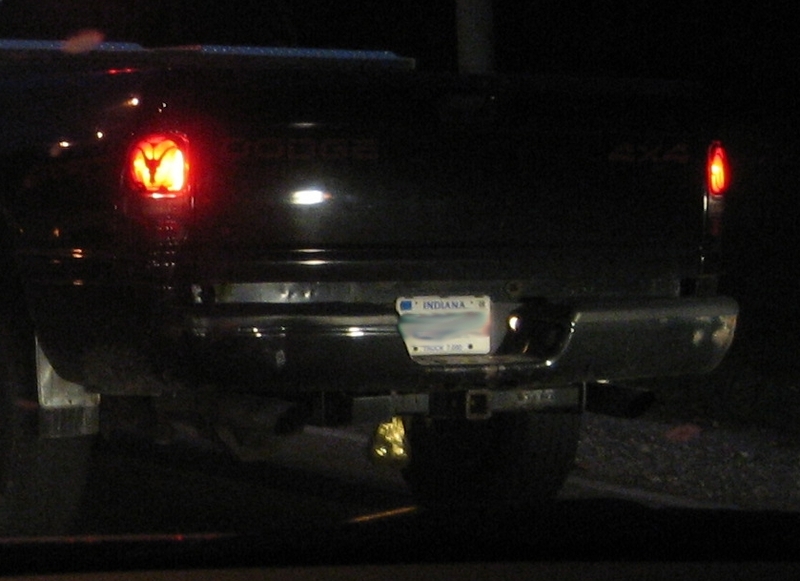 I feel like I’ve seen these before with a disgusting ball hitch cover too but I’m afraid to Google it. You know, I think that might be the only application of a Bush sticker I would like, Julie! Okay, I Googled it. There are all sorts of Truck Nutz and variations. I was not that surprised to see they tried to outlaw them in a bill in Maryland! I guess we’re lucky not to see more of them in Indiana. Fun stuff on your fridge…and in it too. Pingback: Praying Mantis Named Yorick at Nicole, Deipnosophist.